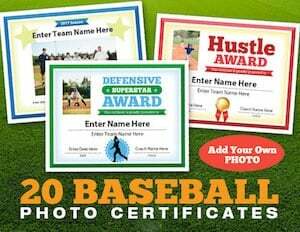 Baseball Photo Award Certificates combine traditional awards with modern digital technology to create a memorable keepsake. Now you can add a photo to your certificate to make it really stand out! 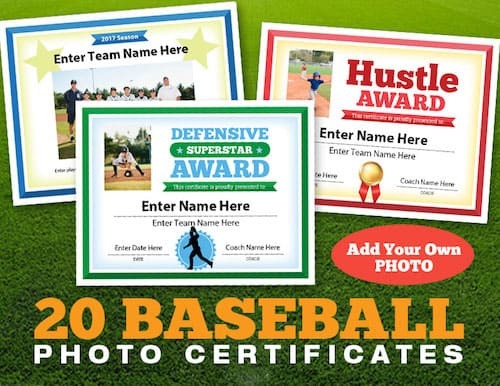 Your players will really value a certificate with a photo of themselves or team, the player’s name, coach’s name, date, team name, words of praise, etc. Just fill in the black text fields to customize and add a photo from your collection. We’ve made it so easy for you to do – just follow the simple instructions on page 1 of the pdf you’ll download with purchase. 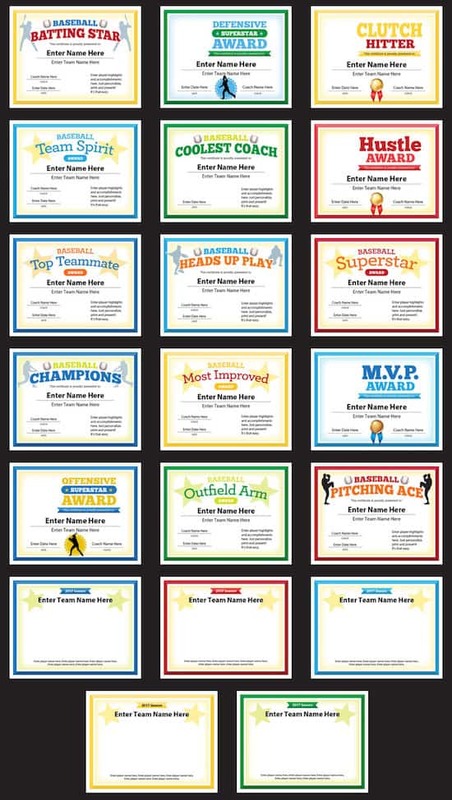 Players and parents hang these awards on bedroom walls, kitchen fridge doors, and bulletin boards. 20 different certificates in all provide you lots of choices. Here’s another cool thing: you can use these templates year-after-year. Calling up each player at a season-ending party to receive some applause and the certificate is how many coaches choose to use these. While others, elect to award them throughout the baseball season. 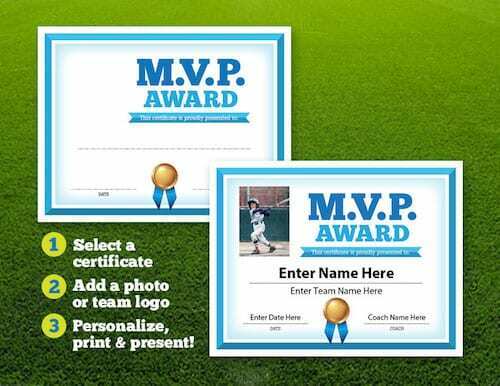 Pick a certificate you like, add a photo or logo, type in details like player’s name, team name, etc., and print. Our new photo feature enables you to include a photo of the featured player, your team or coach. Sizing your photos to 2.75 x 3.25″ or 198 x 234 pixels works best to fit these templates. Your PDF will come as a digital download. The pdf on both Macs and PCs. You just need to have Adobe Acrobat which is available free as a download, but is usually on most computers already. Pick the certificate you’d like to award, and start filling in the designated areas. Super easy what-you-see-is-what-you-get! Hand out a smile with these certificates. It’s a great way of boosting a player’s confidence. And, at a young age, playing with confidence is so important. There are 4 options for the team certificates so that you can use a color appropriate for your team: yellow, blue, green or red. Create a lasting keepsake to mark a fun time in your child’s life. Building a player’s confidence is so important not only in baseball but in all sports and endeavors. 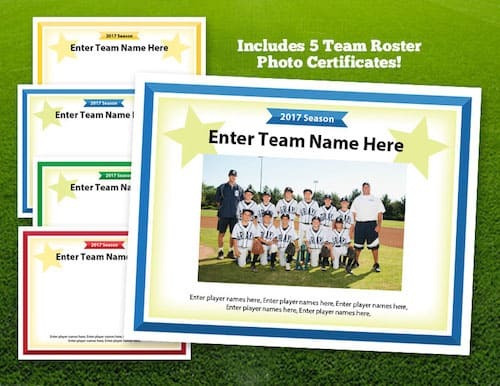 You can personalize each certificate to a player, a coach or a team. Great value: 20 templates for under $20 bucks.